If you’re still looking for more to add to your New Year's resolution list, donating blood could be one option. 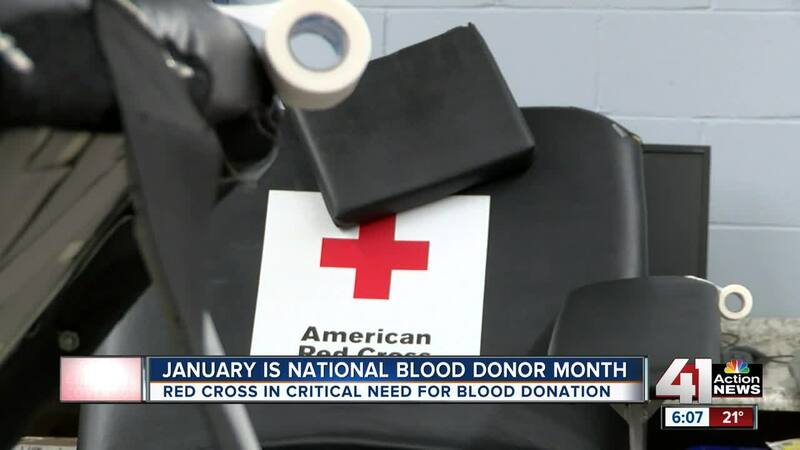 January is National Blood Donor month. According to the American Red Cross, every two seconds someone in the United Stated needs blood. That’s why the organization is urging people to donate. KANSAS CITY, Mo. — If you’re still looking for more to add to your New Year's resolution list, donating blood could be one option. According to the American Red Cross, every two seconds someone in the United Stated needs blood. That’s why the organization is urging people to donate. Randee Krumwidede with American Red Cross said during the holiday season, they typically see a shortage during because schools are closed. About 20 percent of the blood supply comes from students. Illnesses and weather conditions also contribute to the shortage during that time. That’s why in the aftermath of the holidays, teams are focused on collecting what was missed during December to help hospitals in the area. One blood donation could save as many as three lives. Donors are eligible to give once every 56 days. To find a blood drive near you, click here .